Ewok’s back with a new instalment of his video blog. This video features him painting the Oggetti Building in Miami’s Wynwood District during Art Basel this past December friends SP.One, Jick Imok, oh, and Lenny Kravitz. C’mon, you know how good these dudes are (Mr. Wany and BERST), we don’t have to tell you. This video is absolutely off the hook. Presented by The Amazing Art & Ironlak films. 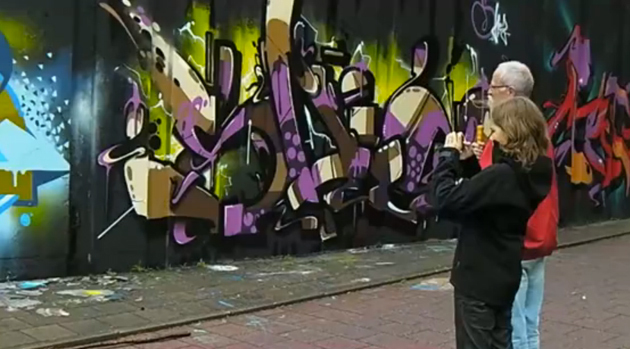 Portuguese graffiti artist MrDheo has put together a video of his recent tour through nine cities: Spain, France, Greece, Holland, Germany and Colombia. Video after the jump! New Jersey based graffiti art collective The Element Tree Team take a trip to Art Basel 2012 with WALL and MR. MUSTART DISTORT to create a nice wall. You know anything SOFLES is involved with is killer, so this video is no exception. Him and his man DHEOS getting it done.